It’s always a welcome sign of satisfaction and confidence when old clients return for more work. In most industries, that’s a given, but much of my client-base is centered around small businesses with limited staff, and so a website is sometimes at best another marketing tool, at the very least a reluctant requirement to being successful these days. Many of my clients keep their sites for years and years, perhaps a testament to the quality and “get it done right the first time” attitude that I personally hold close and try and impress upon each and every one of them as well. Even more so, when a client from one company branches out and begins a new career choice, and decides to use my services to help launch that new endeavor. Such was the case with John Suggs, who I worked with previously on a website redesign for the Southwest Pennsylvania Environmental Health Project over the past few years. John recently moved on to start his own business and got in touch with me to see if I’d like to work with him to get a website up and running for that. When he told me that he would be offering services to adoptees and the parents of those children looking to reunite, my answer was an astound, “Yes!” Anytime I can work with an individual or organization that is helping to improve the lives of others, I jump at the chance. Based out of Connecticut, John’s business Family Orchard specializes in reuniting adoptees and birth parents who wish to do so. He also provides services like forensic genealogy and researches African American lineage pre-dating the Civil War, when ancestry and slavery mix to make things difficult for the average person to find any real history. 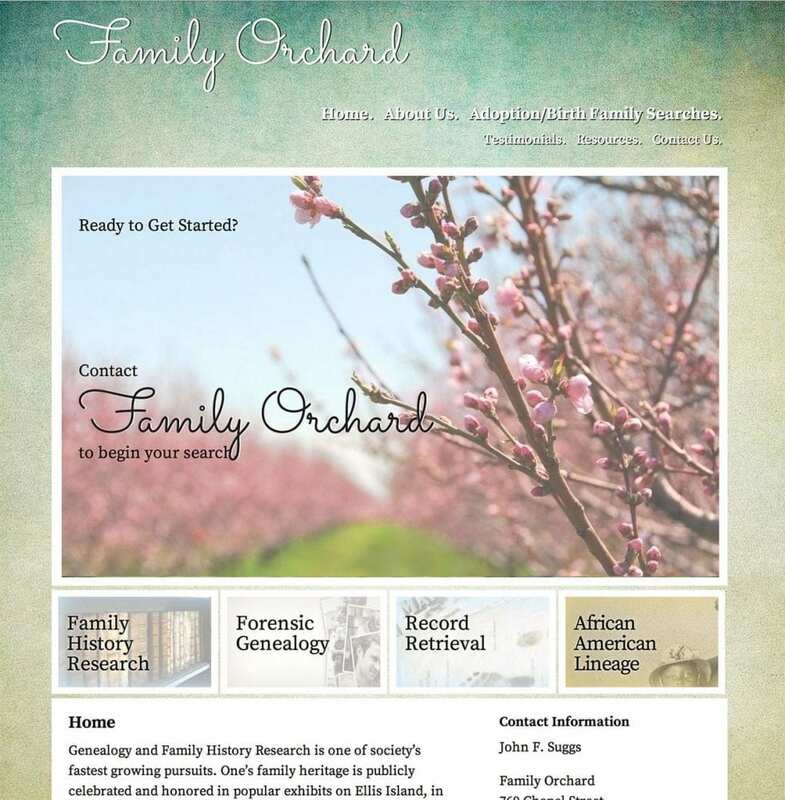 Today we launched the website for Family Orchard, and I’m quite proud of the way it turned out. Built on WordPress, John has the ability to update everything from navigation menus to the imagery on the site to content. Gravity Forms help his clients provide him the information he’ll need to solve their particular cases, and a built in mobile version ensures that the information on his site is available regardless of how or when visitors want to explore the site. In addition to his own services, John provides much information for those looking to do some of the research himself via a plethora of linked resources on the site. And because it’s powered by WPEngine and packed with John’s straight forward, poignant writing, the site is poised to do quite well with the search engines. Whether you’re interested in his services or not, I invite you to check the site out and spread the word on your social networks. You never know who among your circle of friends will be able to find a long lost sibling, parent or child through his good work.